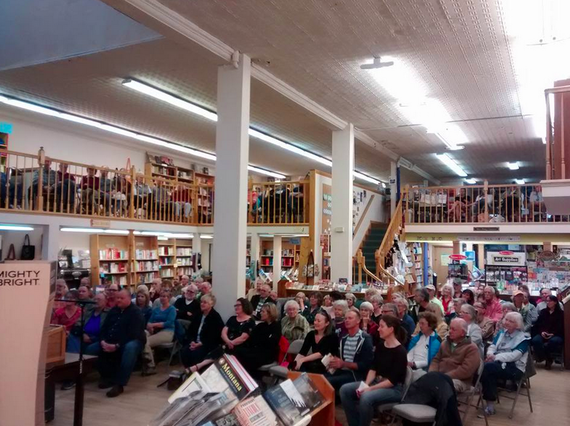 Author's Note: On August 18, 2015, Country Bookshelf in Bozeman, MT hosted a tribute for literary legend Ivan Doig, who passed away in April, featuring Montana writers Malcolm Brooks, Jamie Ford, Craig Lancaster, Russell Rowland, Paul Wylie, and me. These are my remarks from that night. For many people, Ivan Doig is a way into Montana. I remember Sarah Calhoun, the founder of Red Ants Pants in White Sulphur Springs, telling me how she chose her new home entirely on the strength of Doig's account of it in This House of Sky. That is a common story. 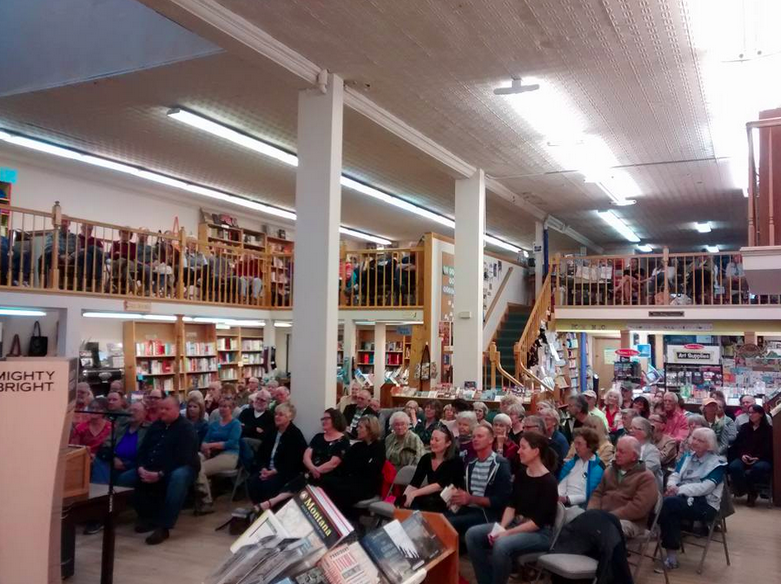 People read Ivan Doig and think they might oughta give Montana a try. Doig is also a way into history. He invites us into a mythical Montana - maybe it really existed, maybe it didn't, but we want it to have existed, because it says something good about who we are that the rough beauty of those lives is our communal history. It makes us believe, as Doig told us, that "Life is wide. There's room enough to take a new run at it." What gets to me with Doig's stories is always the lives. Sure he can chew scenery right up there with Norman "A Realtor Runs Through It" Maclean, but Doig brings us characters so messily stamped from recent memory that I can almost see them in my grandpa's cramped living room, extra chairs drug in from the kitchen, passing around something I wasn't allowed to taste and telling stories like this one from Bucking the Sun in language that was also inappropriate for a child. "Let me get my feet under me, a minute," Hugh was saying slowly, there at the fenceline. "Land like this, taken for a dam halfway across Montana from here? You're sure you're on the reach of the river that you think you are, are you?" Siderius compressed his lips and simply nodded yes. "I can't believe you," Hugh spoke as if telling him the time of day. "A dam that'd - why would they do such a thing?" "It's kind of beyond me," Siderius was forced to admit, "but they're about gonna do it." In spite of himself he shook his head at what was even harder to swallow. "With dirt, no less." Hugh Duff's face changed radically. Watching the man, Siderius warily got back to the part he knew by heart, "appraisal involved ... so-much per acre ... fair deal as possible but ..." But none of it made a dent in the stricken look that had come over the farmer. The growl of the pickup from the far side of the field, the yelps of the two young men whenever the spreader clogged or the radiator spewed, all seemed as lost on this man Duff as Siderius's spiel. "What's that supposed to mean, preference." "In getting hired. At the dam project." Hugh let out an alarming chuckle, a sound of mirth gone dry and bitter. "Man, do I look anything like a skilled hand at that sort of work?" You look about like any other sad sonofabitch of a honyocker who needs a job, of whatever the hell kind, Siderius thought. About like me. I first read This House of Sky in New York, as a junior in college, during a time when I was doing a good job finding lots of things not to like about growing up in Montana and really romanticizing/congratulating myself on my escape to the east coast. But I felt that book deep in my bones, every word, and I think it's not too much to say that, in some crucial ways, Ivan Doig gave Montana back to me, reshaped it for me and made me again proud of it, proud to be from that place that's like no other. And also, crucially, the writing in that beautiful memoir gave me this kind of strange permission, I felt, to write about my own experiences growing up in Montana, something I'd not felt ready or able to do. Something that just hadn't seemed serious enough or substantial enough. But he'd done it so beautifully and with such care and that was and is still so inspiring to me. Of course I later read more of his writing, but This House of Sky is one I'll remember as one of those rare books I found at just the exact right moment. Or maybe it found me. I don't think we could have asked for a better man of Montana letters than Ivan Doig. Ivan Doig is the reason I came to Montana. Decades ago, one of the editors at the Philadelphia Inquirer suggested I read This House of Sky. I read it. Then I read it again. And again. Then I went to Montana on vacation. Then I started applying for jobs there. It only took me 15 years to land one. One of the first things I did upon arrival was attend a book signing by Ivan Doig at Montana Book & Toy in Helena. "Welcome to Montana," he wrote in my copy of The Whistling Season. It brought tears to my eyes then, and does now. I don't think anyone recommended This House of Sky to me. I recall stumbling across it, in college out east like Emily, probably in the big off-campus bookstore where I avoided my Goth first-year roommate. Bookstores are refuges, among other vital services they provide. I read Doig reluctantly, out of homesickness and alienation and every other hormonal emotion a college student bleeds. Mostly, I read Doig because from the first page of This House of Sky, he made me feel pain. My family's history of western homesteading and ranching would not be recognizable to the Cartwrights or indeed, to anyone who got their ideas of the West from watching Bonanza. It started with a Mormon claim-jumping that left the family venturing north in the late summer of 1864 to what we now call the Gallatin Valley. From there the stories are a highly unbelievable litany of death, drought, and unvarnished bad luck that just had its sesquicentennial last year. Nobody got rich. We got poor and poorer, my family, lost most of the land, and then we worked road crews and the floor at the sugar beet factory to survive, while great-grandma gathered dandelion greens and performed faith-healings to keep food on the table. Ivan Doig tells those stories. The question is why in the world we want to hear them, and why we hold them up as what's most precious about Montana. For me, out of my own heritage, the stories are a source of strength, both knowing what my ancestors endured and believing that they did it so the kids could have a better life. With that kind of precedent behind me, I'd better get my act together. For Emily, Doig offered a sense of pride in something she'd only wanted to escape. I can relate to that too. But there are others who come to Doig's work fresh, without the wagon-load of fragrant emotional baggage some of us have where Montana is concerned. In a way, I envy anyone who can come to Doig with a fresh heart and none of the rough-healed scars of history. You'll notice a great many ex-pats among writers with Montana roots, including Doig, and I think it's because his true topic is, as he put it, "that larger country: life." Montana just happens to give an exceptionally good grounding, for better or worse, in reality.